Fewer Than 50 Eclipse Awards Tickets Remain! Fewer than 50 tickets remain for Saturday’s 45th Annual Eclipse Awards presented by Daily Racing Form, Breeders’ Cup and The Stronach Group. 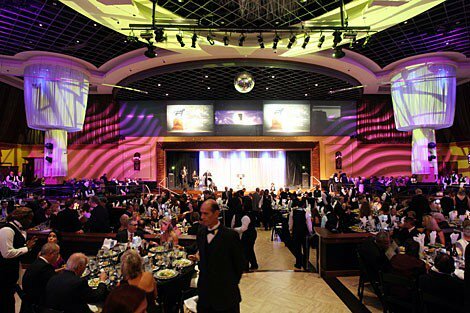 The black-tie-optional event honoring the 2015 champions of Thoroughbred racing will be held in the Sport of Kings Theater at Gulfstream Park Racing & Casino in Hallandale Beach, Fla., with cocktails at 6 p.m., dinner at 7 p.m. and the ceremony at 8 p.m. (all times Eastern). Tickets to the Eclipse Awards are $400 each and also include admission to a Thursday evening cocktail reception at Adena Grill & Wine Bar, the Friday night “Moulin Rouge” party in the Gulfstream Park walking ring, a Saturday morning VIP Welcome Breakfast at the official event hotel – the Diplomat Resort & Spa, Curio Collection by Hilton – and the official Eclipse Awards After Party Presented by the Keeneland Association at Frankey’s Sports Bar. Eclipse Awards tickets and hotel reservations can be had by contacting Casey Hamilton of the NTRA at chamilton@ntra.com.